So then come back! Easy fix. One of the most unique games you'll find. now called Reign of the Wookie Mancer! now called Reign of Mur! Have a Merry and Murry Christmas, everybody! Happy anniversary to the most awesome (browser) game out there! 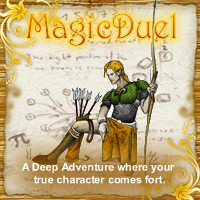 Advance Happy Birthday, MagicDuel Adventure! A experience like no other.. a redefinition of the game concept. Hi all, this game is Awesome!!!!!!!! U need to Play.